The current Sampler is currently not available for purchase; individual cockrings can be purchased here. Three different cockrings, each in a different firmness (Soft, Medium, Firm). We offer these to help you feel the differences between the firmnesses of our silicone toys, while still having a functional product. Note that you may or may not receive the colors pictured! 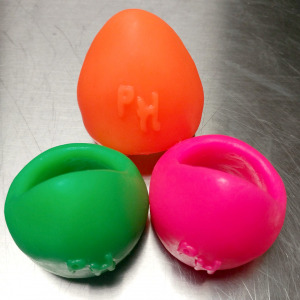 We use only premium materials; our silicone toys are all phthalate-free, platinum-cure silicone. They are completely body safe. For a quick clean, warm, soapy water will work well. For a complete clean, we recommend submerging the toy in boiling water for several minutes. Not for these, sorry! If you want a specific color, please order it separately here.